Not that I'm biased or anything but June is quite clearly the greatest month of the year (besides December, obviously!) Why is June such a great month? Well, because it's my birthday month, of course! As a birthday treat to you guys, for my 25th birthday, I'm offering 25% off all sponsorships. That means prices start at just $7.50 (less than £5!). Just use the code "BDAYTREAT" at checkout. 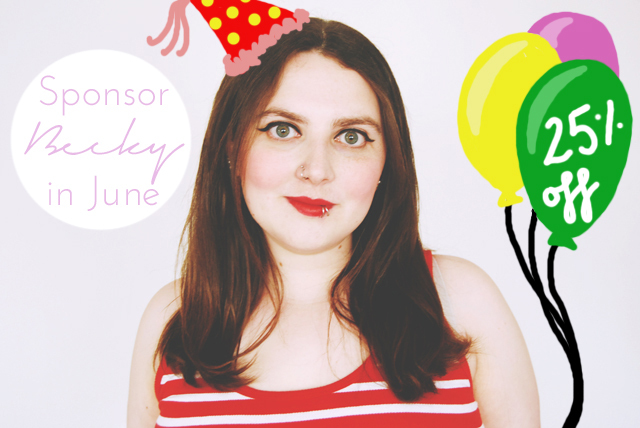 All sponsors get an advert in my sidebar for 30 days, reaching out to my 1450+ followers across GFC and Bloglovin'. You also get a shoutout on Twitter, viewed by 1400+ followers, and, with some of the options, featured in a sponsor post on Becky Bedbug. Full details can be found on mysponsorship page. I'm also happy to host giveaways and review products, so get in touch if this is something you're interested in. I look forward to having you on board!